As an alternative treatment technique for chronic soft tissue pain, Radial Pulse Therapy gives podiatrists a new and innovative method for treating heel pain. 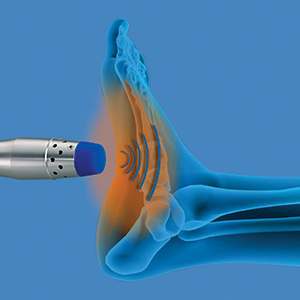 Our practice is excited to offer this new technology, by way of the enPulsPro device, to treat patients suffering from various forms of heel pain. The enPulsPro uses a hand piece containing an accelerated projectile to deliver energy into target tissue. This projectile is accelerated through the electromagnetic transfer of kinetic energy; this kinetic energy is then converted into impact energy in the applicator. Upon delivery to the target tissue, the impact energy then creates radial pulses to treat muscle pain and increase circulation in the area. The treatment itself is performed by the podiatrist; he applies the applicator to the area and administers the energy by moving the applicator over the area in a slow and circular motion. Treatment is administered once a week for a series of 3 to 4 treatments. Each treatment will take approximately 5 minutes, depending on the size and number of areas treated. Radial Pulse Therapy has a proven success rate that is equal to or greater than that of traditional treatment methods, including surgery, without the risks, complications, and lengthy recovery periods. It is a non-invasive method with no incisions and no risk of infection. There is no scar tissue, as there is with surgery; there is no need for anesthesia to be administered during treatment, as there is with high-energy shockwave therapy. Patients treated with Radial Pulse Therapy may be active immediately and resume their normal routine the same day. Many patients find a significant and immediate reduction in their pain. Some patients will feel results gradually after each treatment. Radial Pulse Therapy is not covered by insurance. You can consult with your podiatrist, however, to determine how he can make it affordable for you.